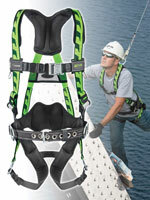 The AirCore Harness combines comfort with functional components. This lightweight, full-body harness is designed with breathable, open-core padding technology that provides optimal airflow. The harness also reduces heat and moisture entrapment, which helps keep workers dry and cool. Patented DuraFlex stretchable webbing offers greater flexibility. A new webbing design creates an original and vibrant style for greater visibility.